What is your most facepalm-worthy moment regarding KSP? I'm sure everyone has had at least one moment where you had to facepalm at something. Could be a stupid mistake you thought you'd grown too experienced to make, could be finding out something that you should have learned long ago. Last week, I was making a return capsule with a Mk.I command pod, and was bemoaning that ridiculous shroud on the 1.25m heatshield when, to my utter amazement, I found a stack node that neatly matched with the stock decoupler. It took about three seconds before I leaned my chair back and groaned at my stupidity. Multiple times, I have failed to deploy my chute due to viewing IVA. I have to pick only one? Anyways, I'd have to say my greatest moment in recent history was installing Test Flight to simulate my launches before actually building them with KCT. Test Flight does not actually let you do test flights. It's a part failures mod. One rocket going sideways later due to asymmetric engine flameout, I discover the part failures issue. It took at least one more launch for me to figure out it also introduces a rated burn time feature, and that it's a really bad idea to burn an engine for longer than that. Or putting solar panels on drop tanks, and realizing you just jettisoned them. Sigh. Certainly not the worst, but the most recent. Boosters left without me, and the left one did a perfect arc to destroy the runway. 100% repeatable, because I did it twice. I rarely facepalm playing the game. But I put on my face protector reading the forums. The worst, for now, was during my first test flight of the Callisto shuttle, about a year ago. Everything went nearly perfectly, just some problem with the control which were too sensitive. So simple, so basic, and so stupid. Hopefully, it ended well and taught me a lesson: always check the gears!!! I had that happen to me while streaming one time . Once upon a time I was sending a mission to one of the moons of Kerbin. I decided to pilot it almost entirely from zoomed out map view, and my brain was on transfer autopilot. Five minutes later I go back into normal view to de-orbit and I find out I'm orbiting the wrong moon. That's the one I can think of at the moment. Easy - 5 Kerbal, multi launch, constructed in orbit, beast of a thing trip to Duna. Boring wait for window and multi week transfer. 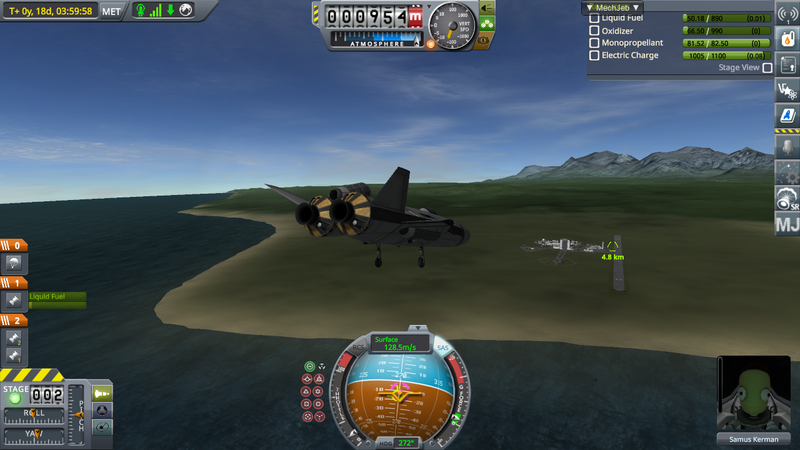 Landed Ascent/Descent vehicle perfectly. Realised I hadn't fitted a ladder. 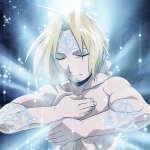 Came straight home, not one of them even EVA'd. No spoiler, just fat fingers on a mobile and you can't delete it! I once put a ladder on upside down. After landing I deployed the ladder, and it went straight up into the air. Another time, I was bring a MK-1 back to Kerbin. 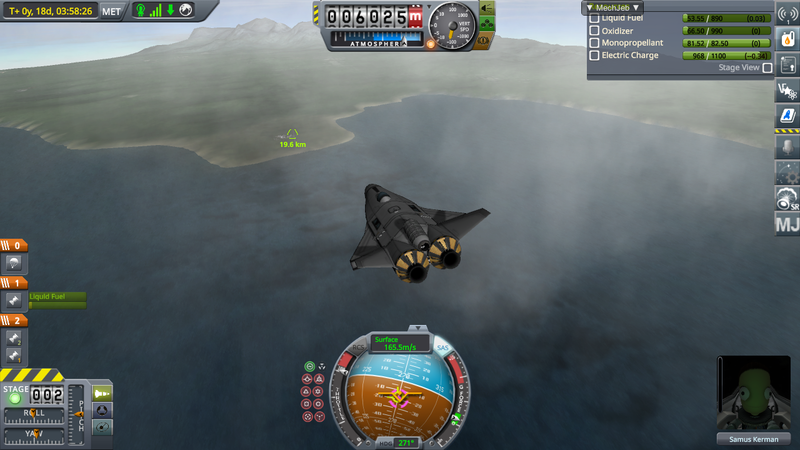 After dropping my Pe for reentry, I decided it was too low and I wanted to come in nice and slow. So, I turned back to prograde and raised it a bit. 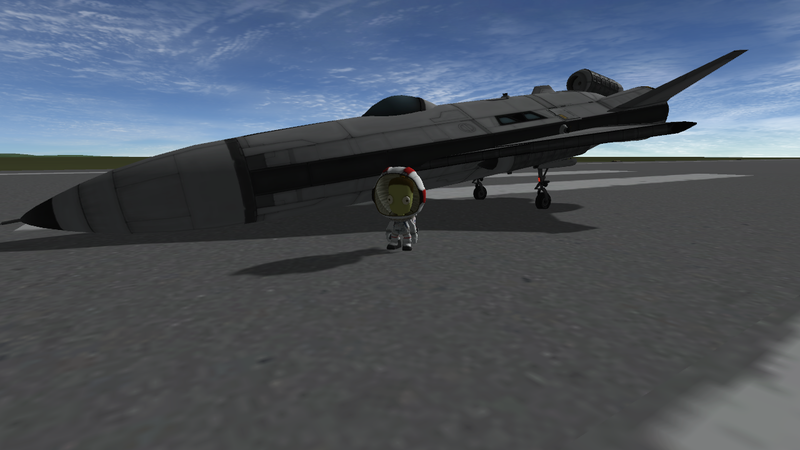 Happy with my new Pe, I staged my fuel tank and engine leaving me with only the MK-1, heat shield and parachute. The staging exerted enough prograde force to raise my Pe to above 70k. D'oh! I face palmed a number of months ago regarding the dev blog. A long time ago I recall coming in for a rendezvous and eventual dock and paying so much attention to aiming directly at my target that I failed to notice how low the distance between the two craft, and how high the relative speed. The ships survived the collision surprisingly intact, and I was able to salvage the mission minus the... ah... liberated parts. Picking up some exploration contracts on Kerbin tonight, the only 'precision' atmo landings I can do are to the KSC, I have a variety of navigation markers setup that give me a good flight profile to the KSC. SO trying to reach Baikinour... Bakealite.... Old KSC... I drop in 80km short of the target. Oh well, new craft, first try, to be expected. And luckily I planned for this as it's a rover. Set MJ's rover auto pilot, and then went to make dinner. Come back, wiggle the mouse, KSP pops up, I'm about 75% of the way there. Here's 2 facepalms moments in 1 mission. I launched an probe that would be my first probe to land on Mun. But i forgot to put an reaction wheel, and every time that i landed, the probe falled, because it was a bit tall. And my last save was way before the probe launch. So i've had to make a new probe. And in another try to land that probe, i lost the communication with him. My commnet was enabled, and i didn't have any relay antenna. Since that, i always disable the commnet when i start a new save, because i'm to lazy to build an complete relay network. I was at a critical point in a complex flight, and wanted to create a named save. So, I quickly pressed alt-F4 and instantly killed KSP. I was just wondering where this thread went. Know what happens when you stage fairings early and the pieces get reflected back to you? You lose your entire solar array and half your thermal control system, that's what. I hate it when that happens. They need to put in a "Confirm Quit?" dialog, for just that reason. Way back in the early days of StarCraft, playing multiplayer on BattleNet, there'd be the occasional noob typing in cheat codes in the chat bar, which of course everyone could see. My response would be to tell them "You need to press Alt-F4 to enable cheats in multiplayer." Next you'd see "DumbS has left the game" followed by a chorus of lols. Eventually Blizzard patched in a confirm quit dialog, and that was that. As for my facepalm moment, if you watch the "LithoBraking" vid in my signature, about halfway through I realized I forgot a decoupler between the heat shield and the previous stage. 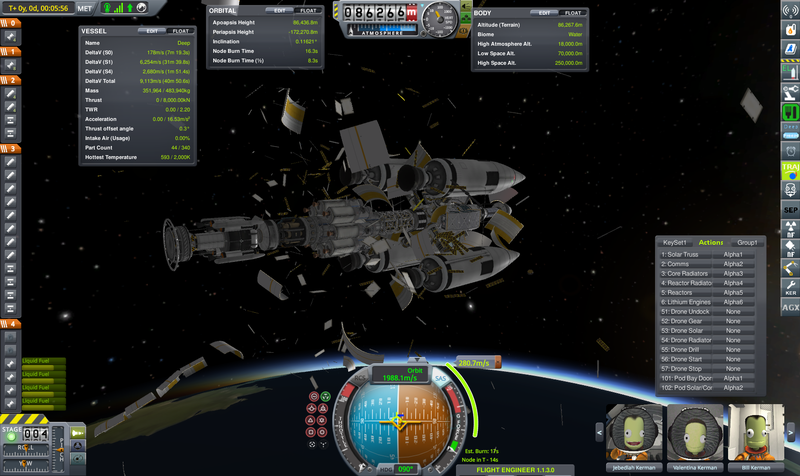 Luckily Eve provided me with explosive decoupling and the mission proceeded. Land fuel lifter next to mining base. Get distracted by gathering a surface sample and planting a flag. Take off and dock with orbital station. Notice failure to actually pick up fuel. What? I don't have attention defici-ooh shiny! It'd be easier to name the moments my face isn't in my palm. I have mad respect for the people who play this without revert/quickload, I'd barely make it off the ground. Edit: okay, here's kind of a funny one. I made a VTOL science/liaison spaceplane for Duna. After sending it up with a recoverable, autonomous RAPIER booster and it was time to make my way to Duna, I discovered that I had completely forgotten to install a probe core, which made it a bit of a handful to fly to get to Duna with my crew consisting entirely of scientists and engineers. Doing an aerocapture to a target orbit with no SAS was a bit of a challenge. They did it though and once the rest of the gang arrived in LDO I transferred a pilot on board. On his first attempt at landing on Kosmodrome Aelita, he overshot, pulled an Immelmann turn, saw the ground approaching really fast, got himself upright, fired the hover jets at maximum power, and gently touched down exactly where he was supposed to. It no doubt looked incredibly impressive, but was actually abject panic. Best was then sending an pack of tiny rovers to mun to land near abnormalities. LOL, i have more of the going to the store to buy sugar issue, come home with two full bags but no sugar. Wanted to upgrade an science rover with a larger solar panel, better antenna and an life support container.